Variety of Surfaces:The Needham Coding S-Series can print and code on a variety of surfaces. High resolution printing is possible on porous elements, such as cardboard, wood, and paper. This makes it an ideal choice when printing on boxes, trays, or cartons. Multiple Printing Options:Designed to offer multiple options depending on your company’s specific needs, this unit can print text, logos, time/date, linear barcodes and data matrix codes and incrementing codes. Large Print:High resolution printing can be accomplished for up to eight lines, within a total maximum print height of 18mm. This will allow you the choice of providing better readability of your codes. 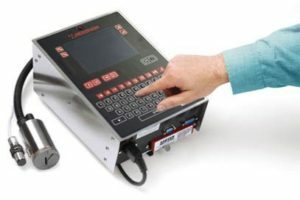 Easy-to-use On-Screen Control: Certain controls can be found on the Needham Coding S-Series screen, such as printer width, direction, and message delay. These controls are simple to understand, which means any required changes during printing can be made without interrupting your workflow. Easy-to-use Touch Panel Control Screen:The control panel of the Needham Coding S-Series was created with the end-user in mind, making tasks such as importing graphics, laying out barcodes and messages quick and easy. This Needham Coding S-Series provides a variety of options, including multi language support, and you don’t have to be a computer whiz to make it do exactly what you need. Sizable Ink Capacity:With ink cartridges that hold 110 mL of ink, coupled with an ink saver mode and the option of “outline” fonts, the operation of the Needham Coding S-Series has multiple ways to help your company save money. Flexible Font Options:The Needham Coding S-Series provides True Type fonts with Unicode support. This means that printing can be accomplished with any font and/or language you desire. Standalone Capability: If you have no need to connect your system to a network, it can function as a standalone unit with ease. Network Connectivity: Although the unit can be used as a standalone high resolution printing system, PC connectivity can be utilized by the use of an Ethernet cable and the on-board Ethernet Adapter Program. This gives you the option of easily integrating it into your existing network. Designed to provide low-cost printing and coding in high quality. The use of a large capacity ink cartridge, along with additional efficiency options, lower the amount of ink being used which, in turn, saves money on high resolution printing needs. Perfect for high resolution printing on porous surfaces, whether you need printing and coding on boxes, trays or cartons. With the use of True Type fonts and a print height maxing out at 18mm, you can be sure that the Needham Coding S-Series is ready for any printing needs that your company requires. Ease-of use is the name of the game. The unit’s screen can easily change printing options (printing speed, direction, and message delay), and the Needham Coding S-Series utilizes a user-friendly touch screen interface, allowing you to lay out the message, including codes, and customize every aspect of your printing needs. If you would like to discuss your particular needs contact Griffin-Rutgers and let us put our 50 years of experience in providing printing, coding and labeling solutions for packaging to work for you. Posted in Carton Coders, Label Coders, Labels & Labeling, Laser Printing, Needham Coding and tagged Coding Equipment.